Korax’ Heritage is an RPG trilogy, spanning an epic story over three mods. The first part of the trilogy is based on the original story of the commercial game Hexen, including its expansion pack, Deathkings of the Dark Citadel. The player picks a young hero of three (one of each order) to defeat Korax and his minions. This game is mostly a first person shooter with lots of RPG elements and cutscenes. The story takes place in an apocalyptic world overrun by evil. The second part of the trilogy takes place a few months after the end of the first part, introducing three new heroes, one of each order – of the three heroes of the first part, only the mage Daedalon survives. For every game, the player picks one of the three heroes. This sequel is a true cross-breed of a first person shooter and a role playing game. 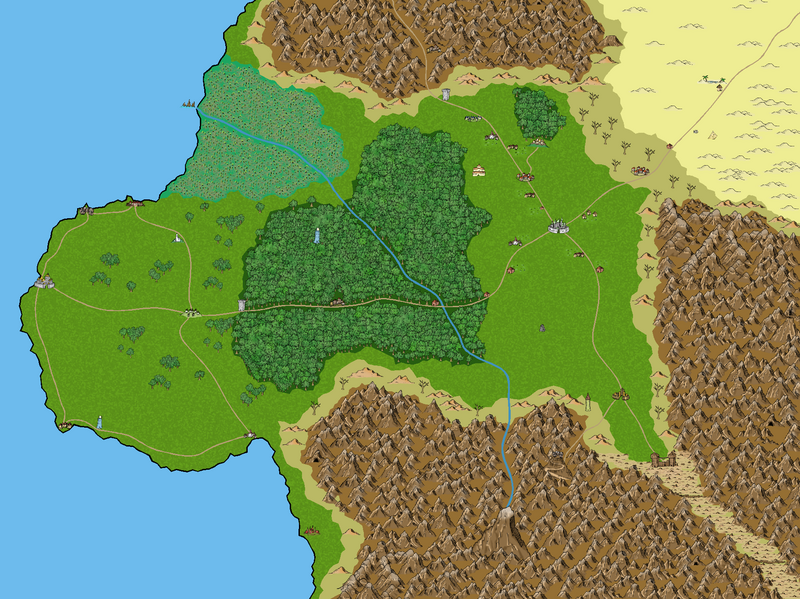 It includes dozens of locations which are connected through a travel map in the style of Realms of Arcania. The story takes place in a corner of the world that wasn’t thoroughly destroyed by the forces of evil. The third part of the story takes place decades after the events in the first two parts. It depicts the adventures of three young people, one of each order (one of them is a girl). The player controls the party of these three and at times probably further characters. This game is a true RPG with all the nuances, using a full 3D environment and a seamlessly connected world, on a distorted scale like in Betrayal in Antara, with combat taking place in a dedicated sandbox in isometric view, like in many RPGs of the 1990s. The story takes the party to many places on a huge continent, in a world where most countries are at peace. 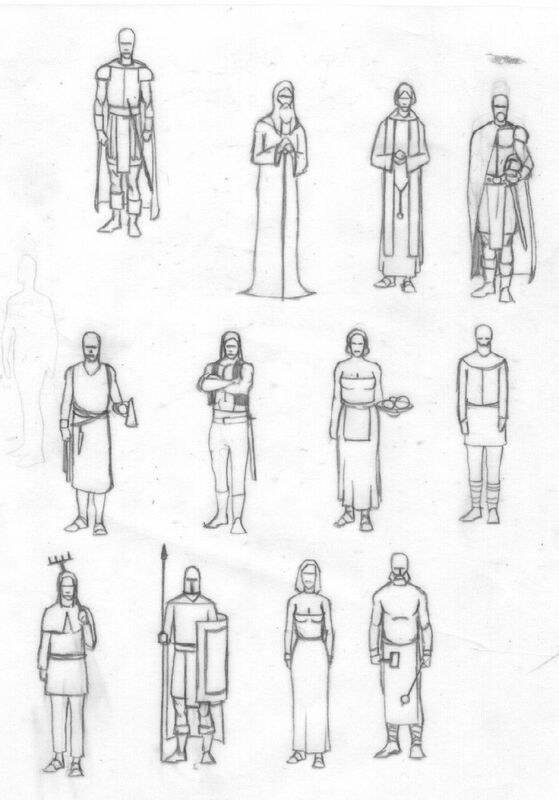 Many of the ideas of the original Korax’ Heritage concept (which is nearly a decade old) have been implemented in commercial games over the years, many of these features in a much more professional way than we ever could (like a huge seamlessly connected 3D world, epic storyline with different outcomes depending on the player’s choices, etc). However, there is one very specific and fundamental feature of the Korax’ Heritage concept that has not been implemented in any game up to this day: cross-breeding a 3D first person shooter with a fantasy RPG. There are many action-RPGs out there, but they are all RPGs in the first place, and don’t offer a simple and quick-paced fighting engine like first person shooters do. And while some shooters did add a couple of RPG elements, most of them didn’t go even as far as KMOD does. 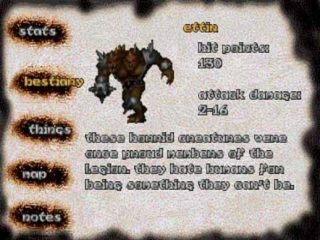 Thus, a Korax RPG could still offer something that’s unique, and offer it for a world that has been dropped by the commercial developer. within every single game between the pre-defined limits. A player who is very good in first person shooters can concentrate on that element of the game, set most RPG features to automatic (e.g. skill distribution when leveling up) or discard them altogether (e.g. skipping on doing sidequests and exploring dungeons), and breeze through the game more with his motoric skills than any collected items – while it is easier to defeat a uber-heresiarch at level 50 with highest quality magic weaponry that takes 10% of his life in a single shot, it is also possible to defeat this boss at level 10 with a tier one regular weapon that needs 500 successful hits to finish him off. On the other hand, the player can choose to explore every dungeon to the last cell, find and finish every small quest and reach the highest possible level and acquire the best possible equipment before attempting to face the final foe. For this end, many hubs in the game will have a quick punchthrough path that allows the player to skip most of the exploration and fights and advance quicker in the main storyline. Since it is possible to travel back to previous maps of a hub, the player can return to easier areas any time to boost levels and acquire money for better equipment, or tackle difficult quests when he is stronger. It is also possible to skip most maps/hubs in the game. The only ones required to complete at all are those that contain an important milestone to advance the main storyline. In many RPGs, the player gets the first couple of levels very fast and it is exciting to level up and unlock new abilities. However, after a time leveling slows down until it virtually stops. KMOD worked this way as well. In Korax RPG, leveling up should keep on being frequent all through the game. The player should be able to reach 50-100 levels throughout the whole game, with the time between levels staying more or less the same after the first dozen levels. So as not to completely unbalance the game, increasing in level should add only a slight boost to the player’s statistics and abilities, like doubling all stats every 10-20 levels. The game’s difficulty is set at start in a two-layer system where the player chooses game difficulty and RPG complexity independent of each other. These values determine the number and type of monsters in any given dungeon map (just like in the original Hexen). All these extras are switched off. When the player levels, attributes are automatically increased. You need to increase your attributes manually after reaching a new level. Some monsters have resistances to certain types of attacks (e.g. wendigos take less damage from frost shards). Some monsters are immune to certain types of attacks (e.g. wendigos take no damage from frost shards). Prices in shops change depending on your interactions: If you sell a lot of the same item, its price decreases. If you buy a lot of an item, its price increases. While traveling the countryside (on the travel map), you may be attacked randomly by groups of roaming monsters. In such a case, you get thrown into a small outdoors map with a bunch of monsters heading straight for you. If you survive, you can continue on the travel map. If you don’t, savegame is your friend. The main storyline is linear, has no separate endings and incorporates the old-school superhero mythos, just like Hexen did. This main storyline enfolds completely while doing the few minimum objectives of the game to beat it. For a deeper and broader story, the player will need to do the sidequests, explore optional places, talk to unimportant NPCs and read books and scrolls to learn more about himself, others and the world of Chronos. The main storyline takes place through a couple of days/weeks/months in Chronos time (there is no exact definition of it through the story). There is no time shift within the game, but different maps might be designed for a different time of the day (foggy morning, scorching noon sun, darkest night etc). While this isn’t consistent, realism is not a goal of the Korax project. Since the player doesn’t sleep and doesn’t need to rest to regenerate health, it is obvious to the gamer that the game is running in “real time” and is thus fast-paced. the middle he knows about the cult and the temple and tries to find it. The game ends when he locates the temple, defeats the cult leader and its hordes of minions (and maybe destroys the temple itself as well). Charybdea is the southernmost province of the Pellonosian Empire. Due to its favorable location along the main shipping lanes, the Northwestern coast of the Charybdean Peninsula had been settled thousands of years ago. Centuries later, the first explorers crossed the vast Praevian Forest and discovered The Golden Valley. It didn’t take them long to realize the extreme fertility of the soil. Within a few years, settlements sprouted like mushrooms all through the valley. A generation later, The Golden Valley became the breadbasket of the Pellonosian Empire, in the process helping along the development of the previous border province in the South, Chrosydea. It’s based on the theory of intersubjectivity, which claims that the world isn’t real, it exists only in one’s imagination. Also, there is a higher power (godhead) that projects this seemingly material world into the minds of all beings, that’s why every being imagines the same world and that’s why they can interact with each other in this world. Now, as to magic, it’s nothing but that moment when a certain being lifts this veil from before his eyes and by seeing that this world is not real and he’s outside of it, he can modify the fabric of this world, changing just a bit of a thread in the fabric here and there, thus making things that wouldn’t be possible after the laws of the world – as long as someone is trapped within that world. After casting the spell, the veil falls back again, and the mage is once again just part of the world, as he isn’t enlightened enough to be able to realize for longer periods of time the vastness of the universe and the cosmic illusion (mahyah), without his mind burning out from overload. That’s why no mage can cast spells without stopping (represented by the numeric value of magic points the character has at his disposal at a given moment). Technically seen, the game will be a collection of standalone maps and hubs, interconnected through a travel map. To exit most maps and hubs, the player will just have to reach a travel point in the 3D world and exit through it to return to the travel map. At certain points of the game, when the player reaches a milestone in the main story, there is a cutscene of some kind. At this point, some maps/hubs might not be accessible any more or they might have changed contents. Also, new maps/hubs might become accessible. This is simultaneous with moving from one Chapter to another. The game is organized into main sections called Chapters. These chapters are story bound and trigger on completion of a story milestone. 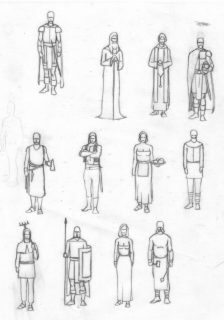 The game has three character classes, the same ones as Hexen (fighter, mage, cleric). Each character class has its distinct features, uses a different spell system and different weapons. The figher uses almost exclusively physical weapons. He can’t learn spells and can only use a few magical items. His one spiritual power is a berserking ability. He can use a large variety of different weapons, primarily melee weapons. He can wear heavy armor. The mage is primarily relying on spells. While he can use a staff in melee, he prefers casting spells with either his staff, his hands or shoot with a wand. He has one staff which he can charge with the spells of his choice and one wand. He also has an extensive spellbook. He can’t wear any armor. The cleric uses a mixture of physical combat and magics. He can use a number of melee and ranged physical weapons and can also cast magical spells. His magic comes from holy scrolls. He can wear light armor. A player has ten slots for weapons (keys 1-0). He can equip a spell or weapon of his choice from the predetermined category in any slot, thus configuring his own custom arsenal. This way, he can always quickly switch between 10 different weapons/spells from the dozens he has at his disposal. Like in Hexen, if we want a weapon to be in the same place for all three classes, three objects need to be placed. Technically seen weapons, weapon upgrades and offensive spells are all the same. They however represent themselves in different ways to the player. If the player picks up a weapon/spell of which type he has none yet, it is automatically equipped in that slot. If he already has a weapon of that type, it goes into the backpack/spellbook only. For the mage, this always means new spells, i.e. a new entry written in his spellbook (zero extra weight). For the cleric, in most cases it means a spell which is an extra scroll in his scrollcase (minimal weight), in the remaining cases an upgrade to one of his physical weapons (sharper spikes for his mace, a second poison holder for his serpent’s staff that enables him to shoot twice as fast etc), and maybe in a very few select cases an actual new physical weapon. For the fighter, it means new physical weapons which means he lugs around his body weight after a time, but then again he is big and strong. The Mage uses a spellbook, in which on every page there is one of 9 types of spell categories. 7 pages include different types of offensive spells; one page lists the spells the mage can use to charge his staff with and another page lists the kind of magical energy he can charge his wand with. The weapon/spell type assigned to each key is as listed below. staff (melee), simply swinging it to hit something. Needs no ammo and counts as melee physical. staff (magical), the same staff is also charged with a spell that can be used to cast a wide variety of magic. This effect is using SP instead of mana for ammo, unlike all other offensive spells, but counts as an offensive spell regarding modifiers by attributes. wand, this can be charged with magical energy, allowing the mage to shoot foes from far away. Needs no ammo and counts as a ranged physical weapon. Depending on the spell class and rank they cost a different amount of mana of different colors, the most powerful spells costing mana of more than one color. The cleric carries around a scrollcase with magical scrolls, and a number of physical weapons. Both his weapons and his spells use mana as ammo. The fighter carries around a large number of physical weapons. He can equip one of each type to be available at once in a fight. Weapons use mana for ammo. Melee weapons work even without ammo, but do less damage. All his weapons are physical, either melee or ranged, even if they have a magic effect. Technically, these are all different weapons, e.g. upgrading a Serpent’s Staff with a second poison tube and thus doubling its fire rate is presented to the player as a weapon upgrade, but the weapon so upgraded is technically just a different weapon of the same category. These include Flechettes and Discs of Repulsion. At any given time, only one of these items is active, and using the secondary fire button will discharge one of these. The Flechette works exactly the same way as it did in the original Hexen for each class. The Disc of Repulsion also works differently for each class. These spells use SP. A certain number of these can be memorized at a time: 3 for the mage, 2 for the cleric, 1 for the fighter. This means that the player has to pick certain of the spells to be ready to cast in combat, can’t just line them all up and have them all at his fingertips. Berserking: ability carried over from KMOD 2. The only fighter ability planned. Heal: The Cleric heals himself for a certain amount (amount and efficiency depends on spell level, player level, player attributes). Convert: This spell converts one or several monsters, if successful. Converted monsters will behave in the same way summoned monsters do. They’ll also keep their current EXP/HP etc. Stop Time: This makes the whole game world and all effected entitites to stop for a short time, in which the player can move around freely. Since time is stopped, nothing can be killed or destroyed, but hits will be registered (e.g. if you hit a stained glass window twice and an Ettin 5 times, the one will shatter and the other die the moment the spell ends). Banish Evil: Banishes a monster like in KMOD 2. Starter version may banish a monster to somewhere else within the map, stronger version may banish monster into the netherworld, i.e. killing it and giving exp (like in KMOD 2), strongest version may banish several monsters at once. Summon Monster: Summons one or several monsters. Carried over from KMOD 2. Sleep: Target falls asleep for a limited time. Probability of spell success and sleep time depend on player level, player stats, monster stats etc. Porkalate: the Porkalator effect of the original Hexen. Create mana: a certain amount of SP is converted into mana of certain colors (efficiency and colors depend on spell level, player level, player attributes). Possession: this spell lets you possess most monsters and control them completely, using their own weapons and abilities (like the impenetrable shields of the Centaurs or the wings of the Afrits). As long as you run around in the possessed monster, your mage’s body stays at one place, undefended. Shield of Blades: throws slaughtered monsters’ weapons in the air and makes them dance around the mage, absorbing damage directed at the mage and causing damage to attackers. The player has one piece of armor (set) and the weapons outlined in the concept document (i.e. only a staff and a wand for the mage, half a dozen weapons for the fighter). The player gets a certain piece of armor at start (like a shining breastplate as a fighter, a smelly robe as a mage) and during the game, he/she only buys or finds upgrades for it that enhance it, and these enhancements replace each other (i.e. only the last one’s effect is active). This would allow the player to concentrate on weapons and spells, not so much on the things you don’t see in a first person shooter anyway. The player should only see armor and weapons/spells both in dungeons and at vendors that are usable by his class. If the code for it is not too difficult, we could just label items by chapter and type, like armor a5 would be a piece of armor in the first chapter, armor c3 one from chapter 3, etc. For weapons/spells, they should be labelled by weapon slot, e.g. weapon3 a5 would be a weapon or spell for the corresponding class for the 3rd weapon slot in the first chapter. Then we could populate all dungeons and vendors once with a set number of weapons and armor, and then only need to create and tweak a table that defines what exactly that given weapon or armor ID refers to (e.g. a golden cuirass, a battleaxe or a fireball spell). If the RPG mode is set to off, there is no damage types whatsoever: all weapons and spells do a fixed amount of damage, reduced by nothing (neither on player nor on monsters). The player’s armor reduces all damage by the same percentage. If the RPG mode is set to simple, there is only two types of damage: physical and magical. The fighter’s armor has a high built-in resistance vs physical damage, the mage’s a high built-in resistance vs magical damage, the cleric’s has both, but only half of what the other classes do. At the same time, certain monster types are resistant to certain types of damage (e.g. wendigos to frost damage, magma serpents to fire damage). If the RPG mode is set to complex, monsters become immune instead of resistant to certain damage types. While there are only a limited number of basic monster and weapon/spell types, most of them have a number of different versions that have slightly different statistics and also look slightly different. Monsters have no level and they don’t react differently to players of different levels. 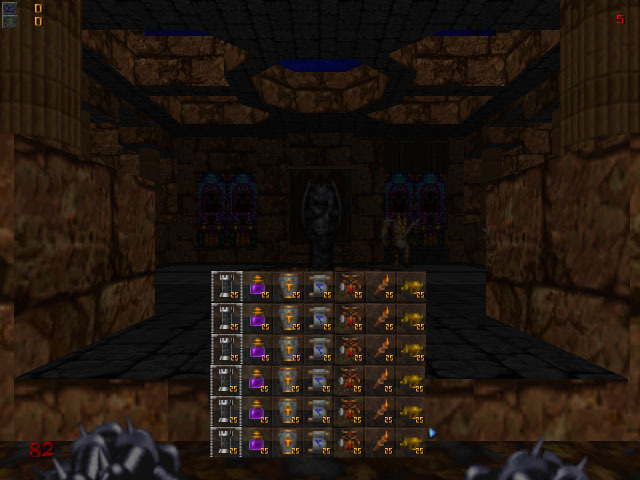 The inventory is somewhat similar to that of the original Hexen, but is two dimensional and is called backpack. There are eight columns and six rows available for a total of 48 storage slots. No item takes more than one storage space and many items can be stacked so that e.g. 20 quartz flasks together take only one storage space. The stackability limit depends on the item. 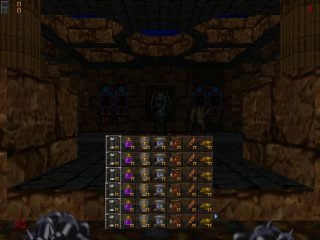 Additionally, the original Hexen inventory remains in a slightly altered form as a belt with pouches; the only difference is that now its width is limited to eight spaces. The belt is a quick inventory, from which often used items can be activated in the heat of a battle. The belt works the exact same way as the backpack (except that it only offers one dimensional navigation), but due to its size and location distracts less in the middle of a fight and thus might be preferred for items like Flechettes or Discs of Repulsion. Also, for a character just starting the belt might be smaller, like 4 slots, and increase in size with either level, be available as purchasable armor in towns, or some other means. Certain specific items a player always carries with himself (like the map, the journal, the spellbook) are not considered items in game terms and don’t take up inventory space. Weapons and armor that are equipped are not taking up any inventory space either. This means that a fighter can carry up to 9 weapons without taking up any inventory space (but any extra weapons he wants to carry do). Spiritual Power (SP) is the developer codename for the energy pool of all three character classes that can be used for casting spells. The official names are (Battle) Rage for the Fighter, Magic for the Mage and Faith for the Cleric. Although they have different names, they all work the same way. The spell system for all three works the same way in the background, but looks and feels different in the game itself. Just as the different classes have different names for SP, their spells also are handled in a slightly different way. While the mage has a big spellbook with chapters and tons of pages as he has a huge number of spells to choose from, the cleric has a significantly lower amount of spells and so he gets a cylindrical scrollcase he can strap to his back that has a bunch of rolled up scrolls in it. And with the fighter, since he has just a few (or even only one) spell(s), there is nothing really needed, just a shortcut key (and if he has several spells, then another key to cycle through the spells to set the active one for the shortcut key). The attribute system consists of six attributes that have names straight out of the classic D&D system: strength, dexterity, constitution, intelligence, wisdom and charisma. Increases the power of melee attacks. Increases the power of ranged (physical) attacks. Increases the speed of physical attacks (melee and ranged). Increases the hit point gain when leveling up. Increases resistance to poisons and diseases. Increases the power of offensive spells. Increases the size of the SP pool. Increases the power of non-offensive spells. Increases the regeneration rate of the SP pool. Increases price at which shops buy items from the player and decreases the price they charge the player for items they sell. Reduces the amount of mana or SP needed to cast a spell or fire a weapon. Combat should not only retain a 100% FPS feel, but it should retain a 100% classic DOOM engine game combat feel – i.e. there must not be “best weapon for this or that enemy” stuff in the way it is in RPGs and some modern shooters. Monsters should have hit points and armor and they should react to any player damage the same way, no matter what kind of damage it is (hit by a mallet, shot by a crossbow, poisoned, hit by a fireball etc). There are gazillions of first person 3D action-RPGs out there that look like an FPS but the moment you enter combat it’s like a spreadsheet application compared to DOOM. This game is about slaughtering a thousand half-dumb monsters in 5 minutes in a flurry of blood and gore, not about reloading a save game twenty times just to find out what weapon or spell works best on this new monster type you just encountered. The travel map concept is a straight copy of the one used in the DSA-Trilogie (AKA Realms of Arkania): There is a beautifully painted map of the world, and the progress of the player on it is signalized by a red line starting from the last point where he entered the travel map. The line is being continually drawn, indicating the player’s movement, until either a crossroads or a location is reached. In case of a crossroads, the player needs to choose one of the available directions (including the direction he came from). In case of a location, depending on the location he either has to enter it or turn back. Once inside a 3D location, in most cases he can use the waypoint where he entered to turn back and get back to the travel map, or explore the 3D location for other possible waypoints where he can exit to the travel map at a different point. The whole map where SE takes place is just a small part of the world, one province of an empire on one of the continents. Some locations aren’t marked on the map, so the player will have to stumble upon them. There are two basic types of locations in SE: combat maps and non-combat maps. These maps include dungeon and wilderness maps. There are no NPCs and no shops and the like in these maps. They are filled with monsters and anything goes (i.e. you need to kill or be killed). These maps include city, town, village etc maps. In these maps, it is not possible to fight, use any weapons or spells. The player can interact with NPCs (quests, shopping, etc.). The largest population centers of the entire province, seats of power. Fairly large settlements teeming with life. Small settlements throughout the province. These include watchtowers, guard towers, castles, etc. A few houses, fields, the like. Located in the pastoral hills, it’s a place for monks to meditate. Located deep in the forest, the tower where Daedalon dwells is a place of mystery. Daedalon’s tower in the northern forest, you talk to him and he tells you he found out about a cult of Korax worshippers lead by an unknown fiend who is rumored to be much stronger than any Heresiarch before, and he has a couple of places in mind where you might find traces of them. So you go and visit all three. From the clues these places provide, Daedalon pieces some more infos together and sends you to the mountain city in the southern mountains. From there, you get directions to a huge cultist base (zowehex, 6 maps). You kill their leader and return to Daedalon. He translated the tablet in the meantime and founds out about a huge army coming from the southeast, so he sends you to the plains city to warn them. The plains southeast of the city, the epic battle where the heroes of all three orders fighttogether (the other two are AI controlled). After the battle, you return to the plains city and with the information you gathered from the slain enemies you can determine a headquarters of the cult in the eastern mountains. very special awesome map with awesome architecture, the uber heresiarch as end boss fight with lots of special gimmicks. the end. The left ~1/4 of the screen is the menu bar. It can be navigated with the PgUp and PgDown keys. The remaining part of the screen is the content part. Ist navigation is always done with the cursor keys and the Enter key, but the exact functions depend on the journal section. With the up/down keys, you can select an attribute or the „OK”. With the left/right keys, you can change a value. When the „OK” is selected, the Enter key lets the changes take effect. The left/right keys let you go to the previous/next page. The up key lets you go to the first page of the section, the down key to the last. Here you can view (the discovered parts of) the map of the area you’re in (provided it’s a combat map). This works more or less as the original Hexen automap, with the difference that you can’t walk while in map mode, it’s always fixed in the non-follow mode of the original version (toggled with the F key in Hexen). That means you can move around the map with the 4 cursor keys, and zoom in/out with the +/- keys. If the player is in a non-combat map, the journal displays a fixed, unscalable image that displays the whole town or village from the beginning. This image is detailed and indicates all important buildings. Here you can view your quests, one quest per page. If you get extra information about a quest, it’ll be automatically added to the existing text of the page. You can go from quest to quest with the left/rigth keys, and scroll a quest text (if it’s longer than the screen) with the up/down keys. There is a base music in all maps (except maybe a couple of places where there is silence as an effect). When entering a special area of a map (like a shop in the town), there might be a different piece of music. At certain special occasions, a dedicated music piece can play as well (like longer conversations with certain NPCs, etc.). Preferred music format is MP3 or some other widely supported compressed format. There is also a pool of dedicated battle music pieces, from which one is chosen randomly every time the player enters a combat of any significance (the exact definition of combat stands yet to debate, it could be any kind of fighting, but also only starting with a certain number of enemies active around the player at a given time point, etc.). A special music engine is needed that can always engage the right music piece. It should be able to mix the music pieces, i.e. when there is a change the one should be slowly silenced over 1-2 seconds and the new one should get louder from zero to normal volume over the course of 1-2 seconds, too. If this music engine seems like a lot of work, Plan B is to simply have a song per map.